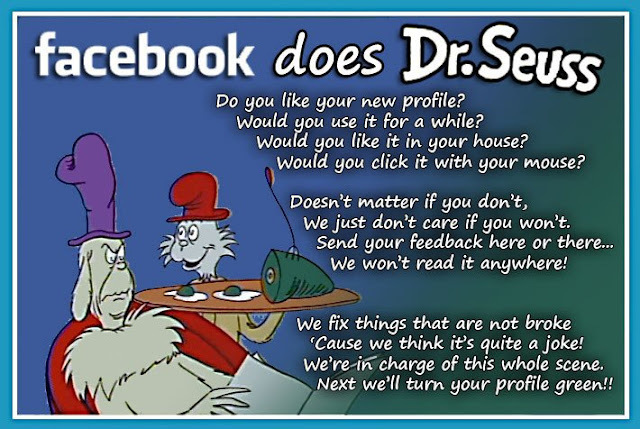 So, there are some big changes today in Facebook world. I am not a huge fan of change, so I am always slow to warm up to them... but this one is especially irking. Facebook isn't content with being FACEBOOK! The new feed looks and feels more like Google+ and ever since Google + came out, Facebook keeps hitting users with these changes. If you are in Facebook land... what do you think? Do you think you'll warm up too the new look, or is it just going to annoy you each time you log in? There is a current fix for the new look, I haven't tried it, but some say if you go to account settings and change the language to English UK, you'll have the old Facebook back. Worth a try if you really hate the new feed. I have told that this doesn't always work, they are probably rolling out the new feed to UK users too. I personally really hate the rolling ticker, well, the fact that I can't get my activity OFF it. I don't like ALL my friends knowing every little thing I do! I don't want my posts on other's pages to be broadcasted to everyone else. Grr. Also, have you noticed that you can now "subscribe" to people who have public posts. Then their posts will show up on your feeds. I wonder if Facebook is going to do away with "friends"? Probably, but maybe everyone changing to it will make Facebook realize people don't like it? Indeed i feel the same way i hate the changes to facebook and wish they would just change it back! I agree...just leave it alone. I barely get comfortable with one thing and it all changes! I feel like I am at the office with all of these changes and corporate doesn't care what the 'little' people think, even if it is for the worse of the company. I left that world, and I don't want to deal with it on my 'waste of time' websites. Maybe I will try the UK trick. I agree with you on the ticker. I don't want all my friends--especially my boss who is a friend of mine on FB--know every little like and comment I make!! It's stupid. I used MySpace years ago and it was so busy and complicated. FB is getting to be like that-and they are killing themselves. Just found your blog today! Have a great day! !